I've been enjoying looking at some traditional chinese paintings lately, as well as feeling some shoujo/MACOTO nostalgia, so HERE YOU GO, Mulan! I wanted Mushu to be more of a traditional-style. Mulan is more in my style, too. Colored with COPIC markers and desaturated a bit in Photoshop. Gorgeous- you have a really lovely art style! ha! I always wanted to see Mushu as a traditional chinese dragon so this is really cool! 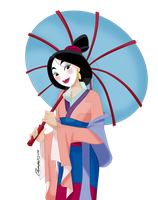 I like the way Mulan looks as well! I wanna scan mine soooooooooooooooooo badly! But it's the stupid printer/scanner, it's not working! How the hell am I supposed to do it??!!!!!!! Please! somebody help me! I feel so pissed whenever I can't scan a drawing! Lovely stylization! It really stood out when I was going through the submissions at #Disney-club! Beautiful. Mulan is always beautiful, and your art is always beautiful, but this is totally beautiful. Just so you know. Love the traditional Chinese feel! 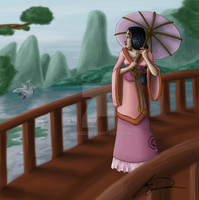 It's a wonderful piece of Mulan fanart. Look at that Mushu! Not travel-sized anymore. Love that she's not all wilting flower here, despite the traditional style. (Faves and recommends) I definitely see the traditional influence here - and I'm prepared to bet I'm not the only one who's glad to see Mulan, not only in that style, but armed and armored. Keep it up! Girl power through Mouse power!